With the British summer coming to a close, we here at Anderson & Sheppard are looking forward to the onset of autumn. With the bright coloured linens and cottons that we have seen go through the making process over the past couple of months now rather unfortunately being placed towards the back of the wardrobe, and being replaced by heavier and more robust cloths. Cloths such as heavy wools, flannels, tweeds and various over coatings will now be making an appearance. The styles of overcoats along with the various individual touch’s a customer may request make for a interesting exercise for the cutters here. 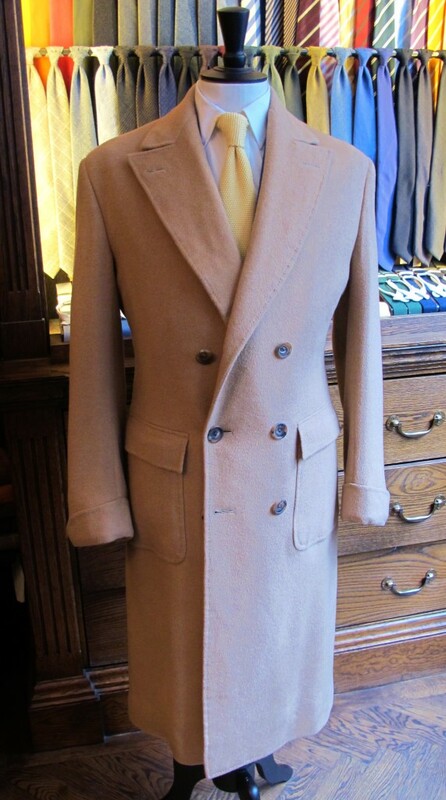 Now many of you may still be thinking that it’s early in the year to be considering an overcoat. However with the sheer amount of cloths available from both our in house stock ranges, along with all those offered by the cloth merchants, in addition to the time it takes to produce a fine bespoke overcoat, that perhaps considering this earlier may not be a bad idea. From a personal view I love Double-Breasted camel hair overcoats; turn-back cuffs, a half belt, patch pockets and a tab to collar all lend more credence to this classic look. In saying that, this is just a personal choice with many in the cutting room insisting just a simple woollen Single Breasted over coat is a must which cannot be beaten. Anderson & Sheppard are able to produce wide varieties of styles, with the aforementioned Single/Double breasted styles alongside polo coats, covert coats & slightly shorter Pea/Car coats all adding a different dynamic to gentlemen’s winter wardrobe.